The Karma Big Softy Oversize Putter Grip has an ergonomic shape and subtle tapered profile to encourage light grip pressure a pendulum stroke. Heavier weight is ideal for those who prefer a counter-balanced putter for added stability and distance control. The Tour Series features a deeply-textured, all-weather design for incredible feel and tackiness, and performance better players require. 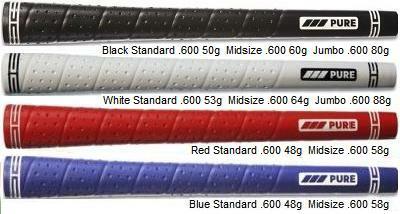 The Tour Series takes JumboMax Grips game-improving performance to a whole new level. All JumboMax Grips are USGA conforming and simply fit your hands better for increased distance, better accuracy and more solid ball striking. JumboMax's patented design and larger diameter provides a superior "Finger-Palm™ grip" that is revolutionizing the game of golf. The Karma Arthritic grip features a raised full-textured surface to promote sensation to those that suffer from arthritis and oversized (+3/32”) to minimize excessive grip pressure for a tension-free hold. The Karma Wrap™ Hi-Tac grip is made from a soft EPDM rubber compound. Add a little color and fun to your game. The Karma Neion II grips feature a multi-textured surface to provide the proper balance between feel and slip-resistance in five distinctive colors; Lime Green, Orange, Blue and Neon Yellow for men and Fuchsia for Ladies. Most OEM adjustable clubs are equipped with a hosel adapter that can be removed and switched to another position to create a different lie, face angle or effective loft. When this occurs the name engraved on the golf grip will no longer be aligned properly at address. For golfers that prefer a standard size putter grip, the Karma Smoothie putter grip series feature a smooth surface with a soft tacky feel. The Karma Sparkle series of grips feature a multi-textured surface to provide slip-resistance, yet maintain a soft feel throughout. These undersized grips are available with speckles of glitter molded into the grip for a unique and fun look. The Karma Super Lite grips feature a multi-textured surface to provide various amounts of slip-resistance for the thumbs and upper/lower parts of the hands where it is needed most. The Karma V-Cord series features cord in the upper half of the grip for superior control even in wet or very humid conditions. The bottom half of the grip comprises of soft rubber to provide comfort and the right amount of traction. The Karma Velour™ Standard Pistol Putter Grip feature a familiar pattern and is manufactured using a soft rubber compound for proven performance. All Karma Wrap grips utilize the same soft rubber compound with a matte finish and provide non-glare, non-slip characteristics. The Never Bend Jumbo putter grip has a NEWLY DESIGNED retriever cup which easily picks up your ball the 1st time, every time and under any conditions. There is a ridge on the inside of the cup which snaps into a groove on the end of the putter cap. This secures the cup to the putter grip and prevents it falling off in your bag. When it time to replace your retriever cup, just pull hard and twist at the same time and the cup will release. 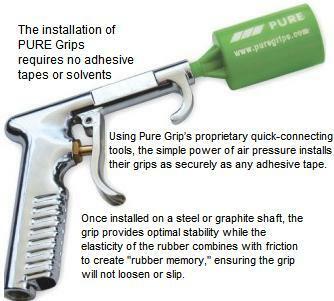 The installation of PURE Grips requires no adhesive tapes or solvents. Using Pure Grip’s proprietary quick-connecting tools, the simple power of air pressure installs their grips as securely as any adhesive tape. Pure Pro Series is a firm grip with a uniform traction groove surface, great for experienced players who prefer a rougher feel, maximum feedback and alternative to cord grips. For golfers seeking a larger grip, the Midsize Pro features a firm,uniform traction grooved surface. Pure's tackiest grip, the P2 Wrap features a perforated wrap design and fits golfers with standard size hands that prefer a slightly softer, more muted feel at impact. This grip is great for wet or humid locations and for those that really like a tacky feeling grip that will absorb some vibration. The new SuperStroke putter grips have a traditional installation process. Simply use double-sided tape and grip solvent to apply. The lightweight 85g size encourages use of a "soft hands" technique and ensures a smooth and fluid putting stroke. The Mid Slim 2.0 came directly from Tour players requesting a size between the Ultra Slim 1.0 and the Tour-favorite Slim 3.0. The Mid Slim 2.0 utilizes our patented NO TAPER grip design, which promotes even grip pressure, eliminating added tension in the wrist and forearms. This helps the arms to swing freely, further enhancing a pendulum putting stroke. The Mid Slim 2.0 produces a more stable, consistent, and reliable stroke. 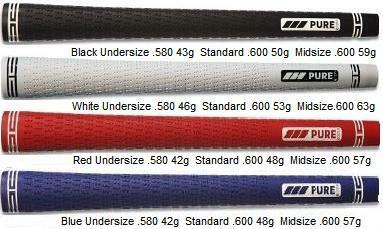 SuperStroke Classic Design started the jumbo, taper-free grip revolution and remain the favorites of many players. Grips are packaged with all you need for quick, easy installation, along with printed and video instructions. Only 1” in diameter, compared to the 1.67” Fatso and 1.3” Slim designs. The smaller design opens up the oversized putter grip to more golfers looking to experiment with a putter grip that will straighten out your putts.